NACC NRM’s Midwest Aboriginal Ranger Program is in full swing and recently the Rangers took some time off to chat at their third regional meeting about how Country is the best office in the world. 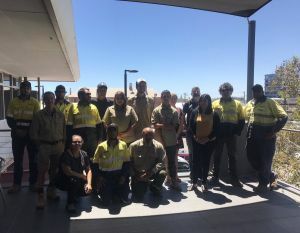 Midwest Aboriginal Rangers from Wedge Island, Jurien Bay, Geraldton and Denham all met in Geraldton to discuss their current projects and share their learnings and achievements – and it was evident that being an Aboriginal Ranger was more than just a day job. The talk then moved into current projects and the wide array of work Rangers undertake – releasing rare mammals on isolated islands, protecting and planting threatened flora and even crowd control for a visiting celebrity were among the amazing projects that are just another day in the life of an Aboriginal Ranger. Department of Biodiversity, Conservation and Attractions Aboriginal Ranger Wesley Sibosado was an engaging presenter and said that working on Country gives him the chance to feel closer to his Elders. Western Mulga Managing Director Sandy McEwan was also at the meeting and said that bringing together a group of Aboriginal Rangers was more than just building a workforce but also about building a family. NACC Aboriginal Program Coordinator Bianca McNeair said the Midwest Aboriginal Rangers talk to their own family about the work they do and how they should conduct themselves on Country. Midwest Aboriginal Rangers will meet again in April to share more good news stories about the rewarding role of an Aboriginal Ranger. The Midwest Aboriginal Ranger program is proudly supported by NACC with funding from The Department of Prime Minister and Cabinet Indigenous Advancement Strategy.